HTC has announced HTC Incredible S. The mobile phone comes with Android 2.1 with Sense UI, a bright 4-inch 480x800 WVGA Super LCD display and stereo surround sound bring a vibrant cinematic experience to the palm of your hand. HTC Incredible S also takes high quality pictures with its 8MP color camera with auto focus and dual LED flash, and it easily enables videos, photos and music to be shared from the handset direct to a TV using DLNA technology. Thanks to the HTC Incredible S’s 1.3 megapixel front facing camera and video call functionality, users will constantly be able to chat with their friends face-to-face. The phone supports 720p HD video recording and also boasts G-Sensor, digital compass, proximity sensor, ambient light sensor, 3.5 mm stereo audio jack, standard micro-USB (5-pin micro-USB 2.0), Bluetooth 2.1 with FTP/OPP for file transfer, A2DP for wireless stereo headsets, PBAP for phonebook access from the car kit, internal GPS antenna, 1 GHz processor, 1.1 GB internal phone storage, 768 MB RAM. It weighs 135.5 grams (4.78 ounces) with battery. HTC Incredible S smartphone will be broadly available to customers across major European and Asian markets during Q2 2011. 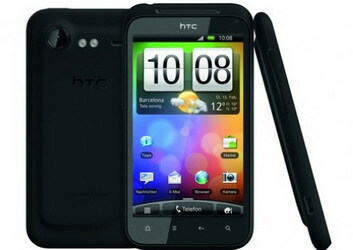 0 comments on "HTC Incredible S Android phone with 4-inch screen announced"